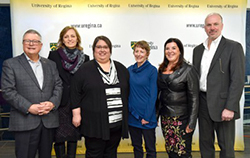 MP Ralph Goodale visited the University of Regina campus on March 12 to recognize the work of Saskatchewan researchers, including SPHERU faculty. SPHERU's Gabriela Novotna and Shanthi Johnson's work were recognized by MP Ralph Goodale on March 12. SPHERU’s Dr. Gabriela Novotna’s project, of which she is a co-principal investigator, received $451,350 to use technology to help people with substance use addictions. U of R researcher Dr. Randy Johner leads the project. SPHERU’s Dr. Shanthi Johnson and her team received a CIHR grant of $485,775 to “implement and study the impact of a home exercise program developed for older adults receiving home care, and their home care staff. The project aims to reduce falls for older adults, and reduce rates of musculoskeletal disorders for support workers. For more, visit the article on the University of Regina Communications and Marketing site.